Cheers Together with 50000+Fans in football games! 60W powerful strong bass soundbar, surround full-range 3D stereo sound, enhanced deep bass, it seems that you are cheering together with 50000+ fans in football games or music show, offer you the best watching and listening home theatre audio experience. Allows wired connections included LINE IN, Optical, Coaxial, and RCA IN so TV and DVD players can connect; Support bluetooth connect wirelessly to your smart TV, PC, smartphone and tablets for an incredible home-theater experience. You do not need to move your furniture around to further enrich your home theater setup. 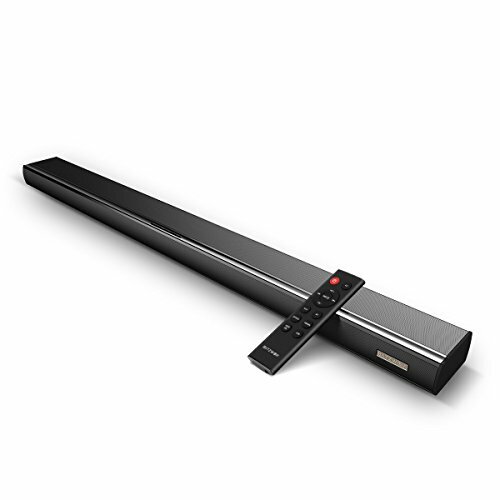 The BW-SDB1 36-inch Sound Bar can be set below the screen for a minimalist, sleek appearance. Even the most advanced technology can be easy to operate with a fully functional, intuitive remote control. BlitzWolf includes a high-sensitivity IR remote that displays the different modes by means of differently colored LED lights. 【60W POWERFUL SOUNDBAR】-- With 6 full range speakers & 2 diaphragms, integrates deep bass, hifi stereo surround sound, fully-coverage surround into living room, experience your favorite TV shows, movies and music with clear, dynamic sound. 【VARIOUS SOUND EFFECT】-- Freely remote switch and match the 3D stereo surround sound for movie, dynamic awesome sound for living concert or music shows, clear dialogue for News and Sport event. 【AUTOMATICALLY ON/OFF WITH TV】-- Smart automatically turn on/off depending on your TV status, also remember the selected EQ mode and automatically adjust to the moderate volume, offer you the best home theatre watching experience. 【36-INCH ULTRA-SLIM PREMIUM SOUNDBAR】-- The slim modern look and all-in-one design maintains a stylish look for your home. It is horizontally sit under the TV screen, the best match to deliver realistic amazing sound for big screen TV.